Bionic is out the door and we’ve started the Cosmic cycle so I wanted to take this opportunity to tell you about our plans for this cycle, the sorts of features we want to work on and what you can expect from 18.10 when it arrives in October. We’ve set aside some time to land fixes in to 18.04.1. As you might be aware, we enable upgrades from 16.04 LTS at the first point release of 18.04 LTS which is due in July. We’re having a week long sprint in June to map out exactly how we want the software store to work, how we want to present information and to improve the overall UX of GNOME Software. We’ve invited GNOME developers along to work with Ubuntu’s design team and developers to discuss ideas and plan the work. I’ll report back from the sprint in June. Snapcraft have added the ability for us to move some application set up from first run to build time. This will significantly improve desktop application first time start up performance, but there is still more we can do. We’ll take a deep dive in to snap start up time and you will see the results of this work apply across all platforms. Chromium is becoming very hard to build on older releases of Ubuntu as it uses a number of features of modern C++ compilers. Snaps can help us solve a lot of those problems and so we propose to ship Chromium only as a snap from 18.10 onwards, and also to retire Chromium as a deb in Trusty. If you’re still running Trusty you can get the latest Chromium as a snap right now. There are a number of kernel options for switching devices like HDD controllers, USB controllers etc to a low power state when not in use. However, in the past we have found that this causes more problems than it solves and so we’ve taken a conservative approach to power management. We’ll be spending time this cycle digging in to these low level options to see what can be done to improve power consumption without sacrificing stability. DLNA is still a thing! Lots of smart TVs include a DLNA client and we think it’d be nice if you could share media directly from your desktop to your DLNA clients without having to install and configure extra packages. Of course, the devil is in the detail – not all DLNA standards compliant devices are, well, compliant. We’d also like to bring back easy creation of SMB shares in to the desktop. We plan to make Communitheme the default this cycle. This has already been widely reported, but we’d like to add integration with the KDE Connect Android app by default. We’re currently looking at GS Connect to provide this feature. Mark recently proposed that we investigate how we could improve the desktop installer by looking at what has been done to move the server installer forward. This is a complex topic and will take more than one 6 month cycle to complete, but we’re going to be starting our investigations. When we introduced the ideas of gathering basic system info from users we made the promise that we would publish that data. This cycle we will be working with the web team to put together a full dashboard type site which will display the data in an easy to read manner. 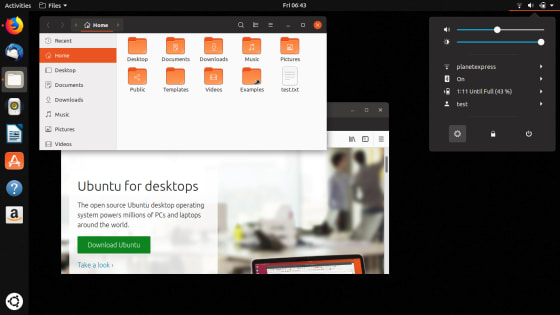 We hope that this will uncover some interesting trends and provoke further discussion about the way we take Ubuntu desktop forwards. Last but by no means least, we’ll be looking at the new latest GNOME release and integrating it in to the desktop. We will talk more about our plans for GNOME in the coming weeks. We’ll flesh out each of these points as we progress through the development cycle and bring regular updates as we go. In the meantime, keep an eye on the community hub for all the latest goings on, calls for testing and conversation.